1743-98. He was baptised at Burton-on-Trent on 25 September 1743, the second son of Henry Byard and his wife Ann. Byard was commissioned lieutenant on 25 June 1773, promoted commander of the fireship Spitfire 8 on 15 November 1782, and posted captain on 17 January 1783. From 9 December 1782 until 17 February 1783 he commanded the Victory 100 as a private ship, paying her off on the latter date. 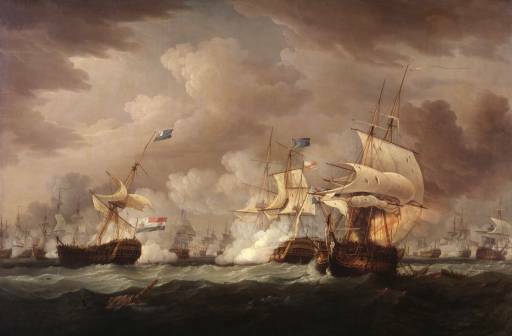 During the Dutch Armament of 1787 he was ordered to commission the Hero 74 at Plymouth, and from 1788 he commanded the Impregnable 98, flagship of the commander in chief at Plymouth, Vice-Admiral Thomas Graves and thereafter Rear-Admiral Sir Richard Bickerton, being given a knighthood on 26 August 1789 for the honour of having steered the Kings barge during his visit to the city on the occasion of the Naval Review on 18 August. He remained with the Impregnable at Plymouth through to September 1791, his ship joining the Grand Fleet during the Spanish Armament of 1790, and the Russian Armament on 1791. Following Bickerton’s death in February 1792 he served as flag captain to the new commander-in-chief, Rear-Admiral Phillips Cosby. At the end of 1792 it was planned that Byard would be given the guardship Powerful 74 at Plymouth, but with the opening of the French Revolutionary War he was instead appointed to the Windsor Castle 98, flagship of Vice-Admiral Cosby, sailing from Spithead with five other sail of the line and two frigates on 15 April, and being present at the occupation of Toulon from August 1793. Remaining with the Mediterranean fleet, on 2 July 1794 he and his admiral exchanged with Rear-Admiral Robert Linzee into the Alcide 74, and this vessel returned home with the Mediterranean convoy at the end of the year, having in company the captured Commerce de Marseilles 130. After arriving at Portsmouth in November Byard left the Alcide on 7 December. In December 1796 he recommissioned the Bedford 74 in which he fought at the Battle of Camperdown on 11 October 1797, at one point being fully engaged with two opponents, and losing thirty men killed and forty-one wounded. From May 1798 he commanded the brand new Foudroyant 80, in which he took a prominent part in the capture of seven French prizes at the Battle of Tory Island on 12 October. Byard was still commanding the Foudroyant when he died aboard her during a cruise on 30 October 1798, leaving Commander William Butterfield of the Hazard 18 to bring her back from Lough Swilly to Plymouth. He was buried at St. Budeaux Church, Plymouth. He married Susanna Tickell on 22 June 1773 at Stoke Damerel, Devon. His youngest daughter, Louisa, predeceased him at the age of ten in September 1774, and he left two other daughters, Harriet and Mary Ann Stuart. He lived at Mount Tamar in Devon.